← Delicious dumplings – homemade jiaozi and guotie. Shouting from the rooftops – would it help me learn Chinese? Recently, when in a local restaurant, I had an exchange with a waiter and I found it rather unusual – he spoke English reasonably well, but he didn’t actually ‘speak’ it, he shouted it. Westerners in China get used to people wanting to speak English with them rather than let the Westerner practice their Chinese language skills, but this was the first time I’d been shouted at. ‘What do you like to drink’ he bawled at me. Rather startled I ordered a Coke and asked for the menu. When he returned with it he shouted at me again. I complimented him on his spoken English but said he didn’t need to shout. He shouted proudly that he studied ‘Crazy English’. Crazy English – what the hell was that? a quick call to one or two Chinese chums and a few minutes of googling gave me the answer. Crazy English (Fengkuang Yingyu 李阳疯狂英语) is an English language learning method developed in the early 90s by a man called Li Yang (李阳). Crazy English has taught nearly 20 million Chinese in over 100 cities to speak English with confidence, it has also made Li Yang a very, very rich man. 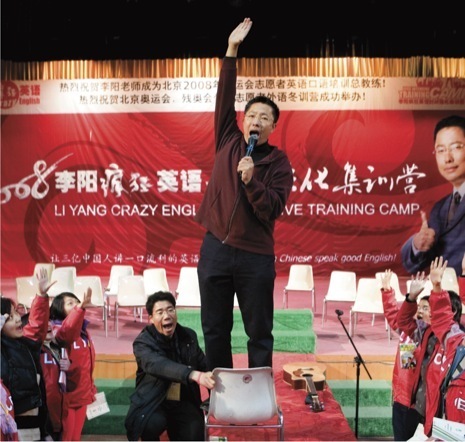 The story behind Crazy English is this: Li Yang was an introverted young man who studied Engineering Mechanics at college in 1986 where he managed to fail 13 of his exams including the national English exam for college students TEM4. He became determined to pass and every day he spent some hours on the roof of his college reading English aloud, and he discovered that the louder he read and repeated words the better he learned them and the more confident he became – eventually he was shouting English. He helped some fellow students by showing them his method. In 1990 he graduated and went to work in a state-owned electronics factory in Xi’an where he continued improving his English and running small English classes on the side. After a short stint working for the English department of a provincial radio station, Li Yang decided to set up Crazy English as a business. In 1994 his first big venture was to hire a 3000-seater stadium for a day and charge people to come for a CE lesson. 5000 people turned up, practically mobbed the stadium, and the rest is history. The company produces all the material for students: books, DVDs, CDs etc, and CE has courses, summer day camps, and stadium shows all over China. 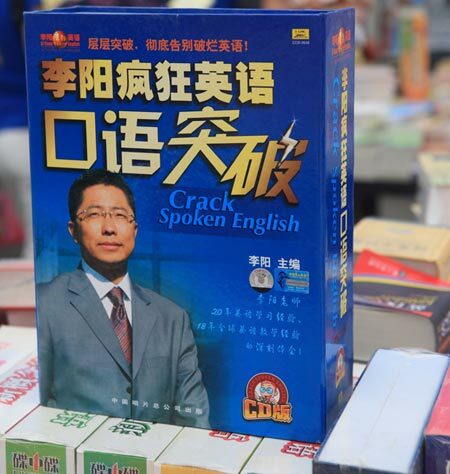 Prior to the 2008 Olympics, Li Yang was employed by the Beijing authorities to teach various groups to speak English – Doctors/medical staff, taxi-drivers, Olympic volunteers, firemen, policemen and even some of the PLA , each had to learn the professionally appropriate vocabularies. 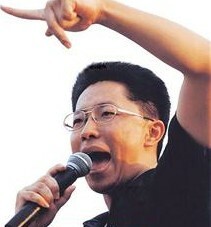 Li Yang bounds around the stage, a cross between a pop-star and a tub-thumping evangelist preacher, exhorting the students to try harder, shout louder and making them repeat words until he considers the pronunciation is correct. 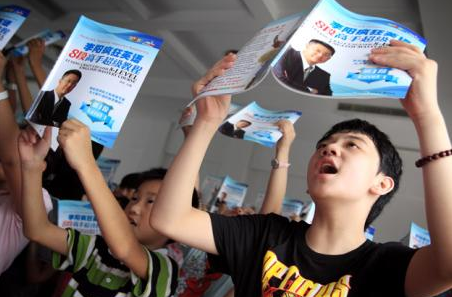 Students can practice by shouting their English at home – on the rooftops, or in parks where they don’t disturb others. 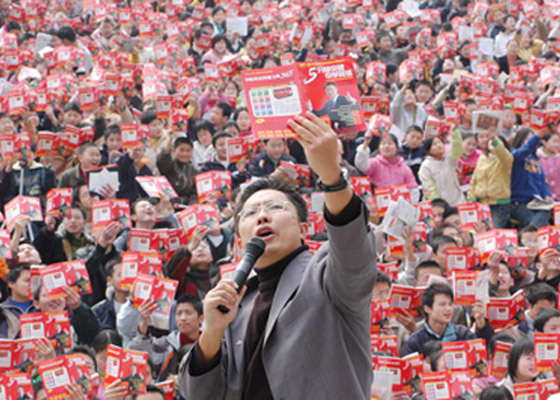 China has an estimated 200-350 million people learning English so there is an endless supply of customers for CE. All Chinese school children have to start learning English at the age of five, they may become proficient in reading and writing, but outside certain areas of the major cities they have little opportunity to practice speaking it and are nervous of doing so in case they make mistakes and loose face. Li Yang and CE have addressed this , and the system seems to induce personal confidence into the students. I asked my own Chinese language teacher about CE – “oh” she said ”I really wanted to do a Crazy English course when I was a teenager, but my parents said it was too expensive I just had to learn my own way” (BTW her English is excellent). She also said that she thinks that CE works well for so many because it instills confidence rather any merits in teaching language skills. What I am wondering is if I should start practicing Crazy Chinese – head up to the 25th floor and start shouting Mandarin from the rooftop – what do you think? This entry was posted in Uncategorized and tagged Crazy English, foreign language learning, language, learning English, Li Yang, shouting, speaking English. Bookmark the permalink. 4 Responses to Shouting from the rooftops – would it help me learn Chinese? Imagine all those Chinese shouting at the top of their voices at the same time – makes my head ache! Great post, Jo! I do all I can to ensure my students NEVER learn by shouting!! Thanks for Natan’s card too. Dad owned up to the spelling mistake! What does the future hold for Li Yang and his crazy ways? Although Li works year round, has made enough money for an early, comfortable retirement, and suffers from many physical ailments caused by the intensity of his work, he does not plan to quit any time soon. In fact, he is developing plans for a bigger, better, more “crazy” company. For the past two years, Li has been experimenting with English “concentration camps” in Beijing. 24 For twelve days, up to thirty participants can attend ten hours of English language classes (1660 Yuan per person). Li also hopes to bring his Crazy English to the prisons. He believes that prisoners would be the best students for his lectures because they have essentially given up on their past and are ready to build new and productive lives for themselves. The inmates also have a lot of time on their hands, which is a very important factor in learning a second language. Another of Li’s plans is the incorporation of bodybuilding clinics and psychiatric counseling into the company’s repertoire. This expansion demonstrates Li’s belief that a strong mind needs a strong body. Chinese is rated as one of the most difficult languages to learn for people whose native language is English, together with Arabic, Japanese and Korean. Thanks.